DREAMSOFT PERU Review 2019: Is DREAMSOFT PERU a Good Hosting? DREAMSOFT PERU offers a choice of SSD plans with Microsoft or Linux operating systems. The higher-priced plans are quite expensive, however, the base plan includes all of the value added extras with a good level of resources for most website owners. DREAMSOFT PERU has been providing hosting in Peru since 2005. With more than 10,000 customers, this company offers all-in-one hosting with everything you need to get started. The (slightly buggy) website is available in Spanish. DREAMSOFT PERU claims that your website will be “up to 20 times faster”, if you host with them. I can’t tell you if that’s true, but what I can tell you is the plans use Intel Xeon servers with SSD disks and have several performance enhancing features and website acceleration tools such as Nginx, Apache, CloudLinux, and CDNs. It offers three regular “Hosting” plans (there is a separate series of ASP / MIcrosoft plans as well), which offer a kind of all-in-solution with most of the key features a beginner needs to get started. 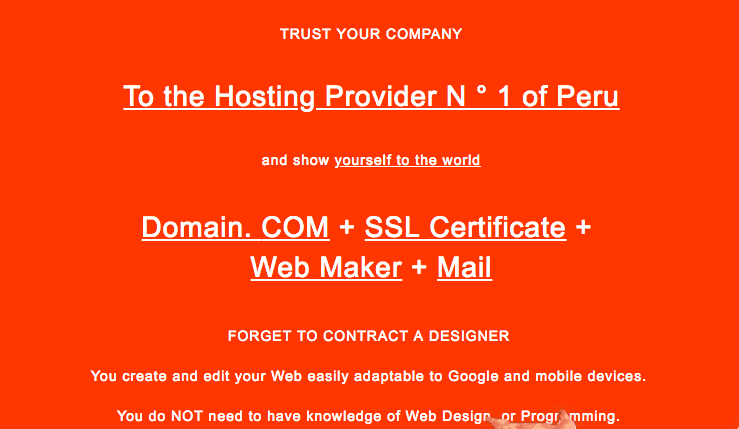 Briefly, these plans all include a website building tool, a .com domain, SSL certificate, and mailbox. The website building tool is DREAMSOFT PERU’s own brand and can be used with no coding experience. Apparently, it takes less than one hour to build a website using the tool. There’s also all of the usual features you’d expect with a shared hosting provider e.g., PHP versions 5.3 through 7.2, MySQL databases, Microsoft SQL (for ASP plans), phpMyAdmin, and a premium Softaculous installation with more than 280 programs. There’s even SSH access. The situation is less clear with advanced programming languages and Cron jobs, which do not appear to be included, although I couldn’t confirm this with customer service. The plans come with a 99.9% uptime guarantee, although as always, be cautious as this doesn’t appear to be backed by an SLA. The prices appear quite high. However, you do have to remember that a lot of inclusions which are usually added extras are bundled into the hosting price. Domains, SSL, and the website building are all included, so the prices cover most of your expenses. The plans can only be bought in one year terms, which is quite strict compared to other hosts. To soften the blow, there’s 30-day money-back guarantee, which gives you time to trial the plan relatively risk free. Customer service is 24/7 by phone, email, and live chat, with an advertised average response time of 30 minutes. There’s no knowledge base or help desk on the site, so you are reliant on the customer service team, which may be off-putting for some people. I contacted them on live chat (during the nighttime Peru time) and although live chat appeared to be online, the operator did not pick up. I sent a message anyway and despite waiting five business days, I did not get a response. 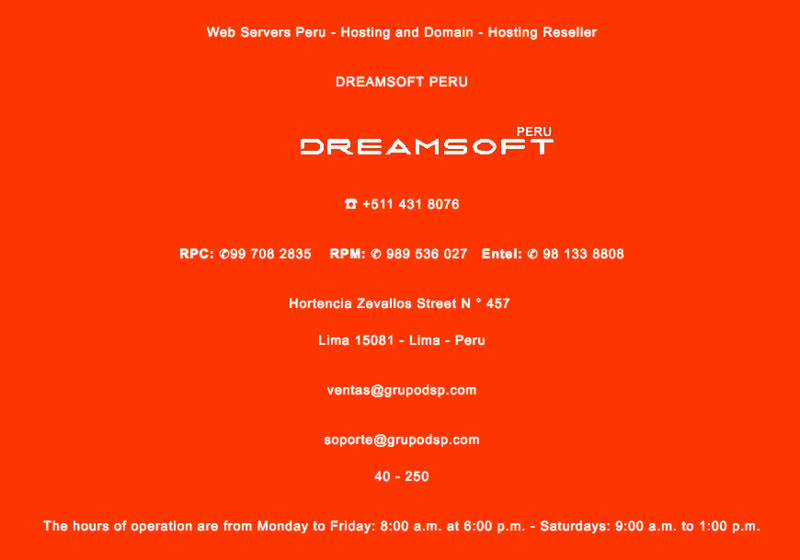 DREAMSOFT PERU has been proving Peruvian hosting with SSD, CDN, and cPanel since 2005. The higher-tier plans are expensive, however, the lower-tier plans with 10GB of bandwidth and 1GB SSD disk space have generous features and resource allocations. Purchase beginner friendly hosting with DREAMSOFT PERU ! Wondering how DREAMSOFT PERU stacks up against other Web Hosting companies? Enter any other Web Hosting company and we will give you a side-by-side comparison.